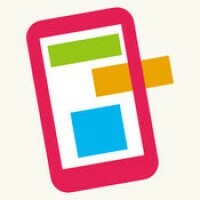 The app is free and you can publish a website for free. 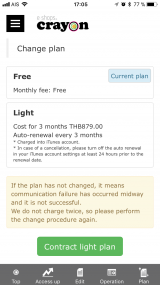 A paid plan is available as a 3 month subscription for $39.99 and this offers HTML code edits, the option to use your own domain, Google Analytics integration and others. To register with Crayon you need either a Google account or a Plesk account. If you haven't heard of Plesk, you're not alone. After selecting a template you are ready to edit your website. In Crayon, the template is a sample site you edit to make it your own. Crayon is a feature-rich website builder, so the chances are that you will get lost sooner or later. In which case, open the main menu via the top-left hamburger icon ☰, and then tap "Top" to see a shortlist of the main functions. 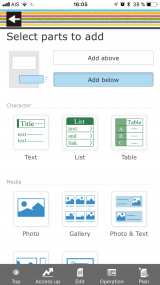 Various kinds of content (text, tables, images...) can be added to a page. 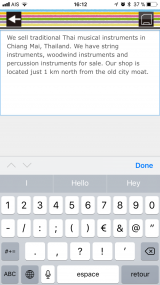 In the text editor, you can only type plain text, so there is a lot of room to see and check your text. On the published website, words are broken into new lines at any character. An issue is that line breaks occur in the middle of any word, not only in portrait mode, but also in landscape mode and on computers (see above). 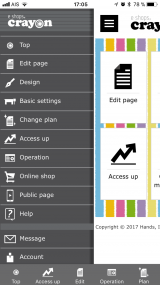 When adding a new page, you can either create it empty or create it based on a template. At first, creating an empty page can seem daunting, but it's a good way to organize your content in your own way. Once you decide if you want to add text, an image, a table, a YouTube video, a Google map... it's very easy to add what you want with a few taps. The template that you selected at the beginning does prevent you from changing the layout & design afterwards. 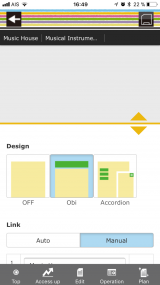 For example, you can choose between a horizontal page menu (called "Obi") and a vertical menu (called "Accordion"). The names of these options are not really meaningful but there is a helpful preview in the upper part of the screen. The color theme can also be adjusted later, but you might never find a color-scheme you really love. 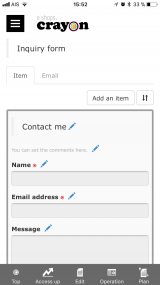 The form on the Contact page can be customized easily. After a couple of hours, you'll get used to the main menu and will quickly find your way around the Crayon editor. Since the labelling of the interface elements is not so clear, some trial-and-error will be required before you can do what you need to. Once these hurdles are overcome, you will probably find Crayon comfortable and find it quite an efficient tool for building a website. 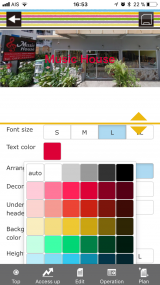 Websites generated by Crayon look limited on computers but better on mobile phones. The free version of Crayon provides basic visitor and page view stats for the past week. In the aid version Google Analytics integration is possible which allows very advanced website traffic analysis. At first you will probably get lost, because there's no prominent main screen and the location of the "Publish" button is a bit strange. The English labels in the editor are ambiguous, so learning how to use the Crayon app takes longer than it otherwise might. 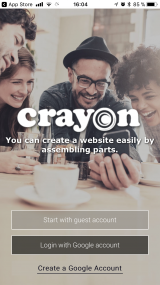 If you have an Android device there is an Android app also and Crayon works the same on all devices. It's basically an online responsive website builder. When using Crayon's editor to make a change (for examplethe site title in the picture above), you do not even need to "Apply" to view the changes: changes appear in real time in the upper part of the same screen. This is helpful design, which compensates for the fact that many elements in the editor are not clearly labelled. Help in the app is mainly provided by the FAQ page. The questions and answers within are relevant. It's a pity that the search feature in the FAQ page does not work. In the Design / Navigation menu there's an option to completely hide the page menu on the generated website. It's possible that this is intended for one-page sites but if used on a multi-page website it might prevent search engines from indexing the site properly. Even with your best effort Crayon is only capable of producing very old fashioned and limited looking websites. It's too easy to create poor layouts, awkward spacing and borders, and uninteresting fonts. All the published sites I could find indexed on Google looked poor on desktop screens, although most look better on mobile screens. One unforgivable flaw is that words are broken, without hyphenation, onto new lines at any character. The in-app preview of the final website is, however, accurate. 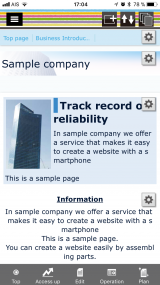 Crayon websites load fast and perform reasonably well in Google's mobile website test. Description tags for Search Engine Optimization can be set. Title meta-tags for each page are automatically filled with the page title. Note: On a public page, any change saved in the editor is put online automatically (auto-publishing). If you don't mind the limited design possibilities and ugly line breaks, and don't get too irritated with some confusing labelelling on the app interface, you will probably complete your website on Crayon and enjoy many features of this app.